Modernisation by Marketisation? How the commissioning, choice, competition and contestability agenda threatens public services and the welfare state. 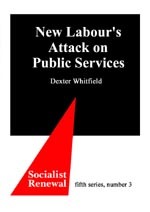 New Labour is creating markets in public services on an unprecedented scale. Privatisation inevitably follows marketisation, eroding democratic accountability and embedding business interests. Alternative policies and strategies must build on the support for democratic governance, social justice and the welfare state. As this timely book makes clear, action by alliances of trade unions, community organisations and civil society organisations is urgently required.